If you have been involved in a motor vehicle accident, you probably have immediate concerns and questions about your medical bills and your loss of income while you recover from your injuries. You may also have questions about what the future holds. Will you have permanent problems resulting from your injuries? Will you recover from your injuries sufficiently to be able to return to work? These are valid concerns and appropriate questions. While motor vehicle accident cases are characterized by many lawyers as routine, Mr. Hernandez knows they are anything but routine. From his years of experience as a trial lawyer with an insurance company and from his work representing clients who have been injured as pedestrians, passengers, motorcyclists, bicyclists, and drivers, Mr. Hernandez knows that each accident And each client’s injuries are unique and may have hidden complexities. He also knows that insurance companies and their lawyers count on the fact that most lawyers will handle motor vehicle cases as routine. Thus, for each motor vehicle accident case that Mr. Hernandez handles, he understands that sufficient evidence must be developed to demonstrate that someone else was at fault for the accident. This may require obtaining police reports, interviewing witnesses, taking photographs of the scene and the vehicles involved, and possibly even reconstructing the accident. In addition, Mr. Hernandez understands that the nature and extent of your injury must be fully understood before settlement is even considered. In some cases, it may be important to have a thorough examination by medical specialists to determine whether you have any long term injuries resulting from the accident. Mr. Hernandez draws upon his years of experience as a trial attorney and his knowledge of how insurance companies work to take the steps that are appropriate to the unique circumstances of each case. 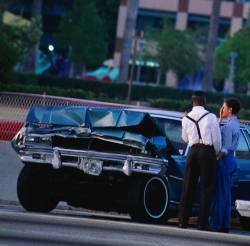 If you have been injured in a motor vehicle accident, call Mr. Hernandez for a free consultation.